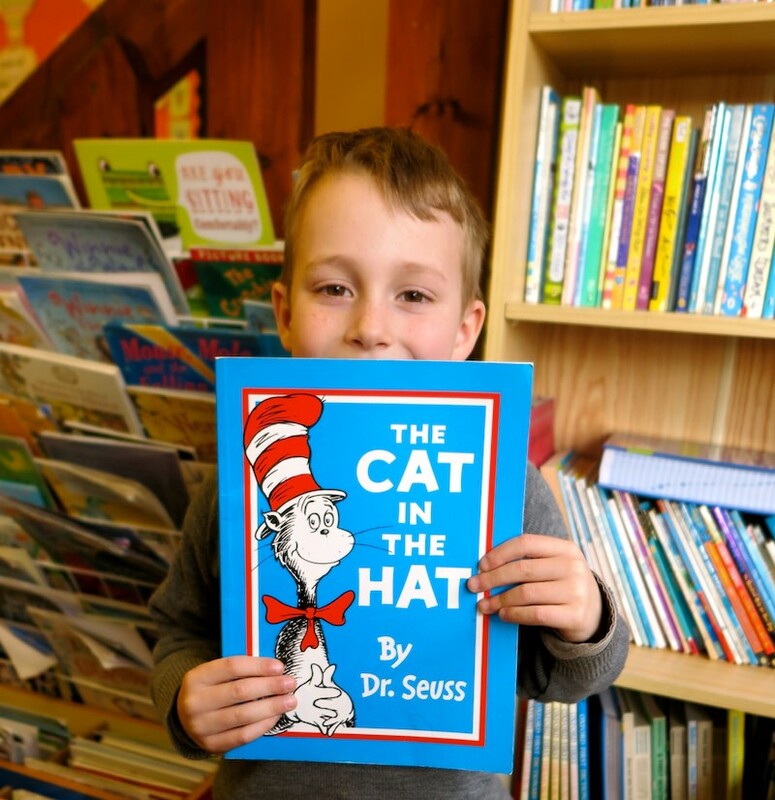 Sompting Abbotts’ staff pooled their knowledge and experience to create this list of top 30 books for Key Stage 1 children for you. 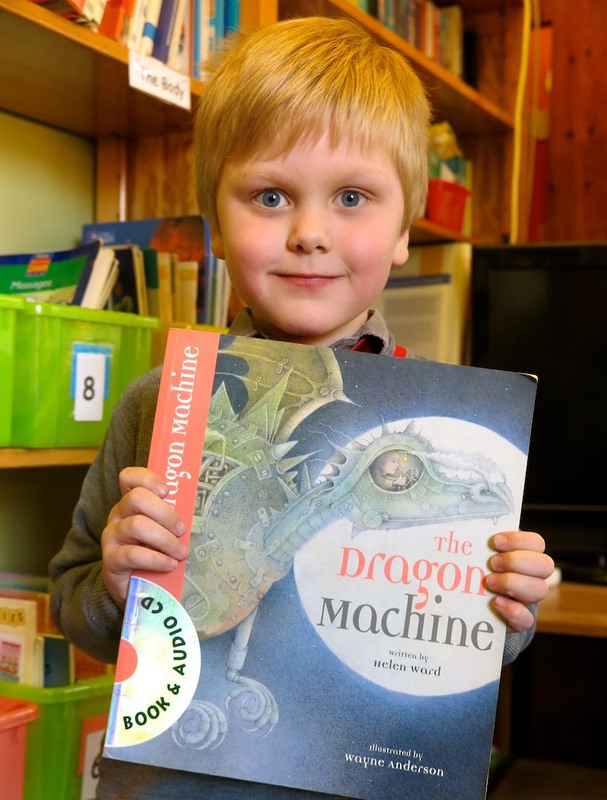 It's across the ages of five and seven – in school terms this is Key Stage one: Reception, Year 1 and Year 2 – when most children learn to read. This is an age group for whom, even if interests and abilities vary, it’s a crucial time to establish a love of books and getting them to ask questions and come up with their own answers. We think it’s our job to get books right at this age, to build literacy foundations and keep children engaged with reading. Books should be all about fun – and definitely not about being obliged to read. Some children at this stage aren't yet ready to read; others are reading fluently and independently. But in either case, generally it’s the books with children-friendly topics, imaginative characters and captivating illustrations that fit the bill best. They’re the books that open up a whole new world to the child and whet appetites to turn more pages and open more books. The younger children who don’t yet read unassisted will still like to have plenty of picture books in the mix with lots of reading appeal. They’ll also be happy with repetition and will want to return to their favourites time and time again. The older children will have progressed to proper chapter reading and be well on the way to enjoying mini-novels of the ilk of Roald Dahl. So here’s our list of our favourite books for each year group. Whether your children are reading them alone or you’re reading them to them, no matter. And on that note, having story time at home each day and making it a regular habit is one of the best things you can do for your child. It helps cultivate active listening skills, gives them a head start on language skills, reduces screen time (here’s to that!) and makes them much more likely to pick up the habit of reading. 1. The Very Hungry Caterpillar by Eric Carle. First published in 1969, it's still as relevant and as popular as ever. Children are amused by all the foods caterpillars don’t really eat. It encourages the children to find out and think about what caterpillars do eat. We can watch the life cycle of the butterfly happen before our eyes in the classroom. We can release the pretty butterflies out into the world to fly away: magical! 2. The Three Little Pigs by Patricia Seibert. Children of this age enjoy hearing stories that they're familiar with. This traditional tale gives us a great reason to go out into the school woods and have fun making stick houses for our toy pigs and ones big enough for us to go in as well! 3. The Little Red Hen by Henriette Barklow. It's important that children learn where our food comes from and this book has strong repetitive text the children can join in with. There's also a lovely discussion point at the end as to who should be allowed to eat the bread? We use this book for a bread-making activity. The children discover ears of wheat and grind them into flour and then make their own bread rolls - mmmm delicious! 4. Oliver’s Vegetables by Vivian French. This is a lovely book for making children think about where and how our vegetables grow. We like to read it and then go to visit a farm shop and see the vegetables growing in the ground. Then we come back to school to make a tasty vegetable soup. 5. Oliver’s Fruit Salad by Vivian French. An amusing story. Children enjoy tasting unusual fruits and making a fruit salad. It is a talking point that not all fruits that we eat can be grown in this country. 6. 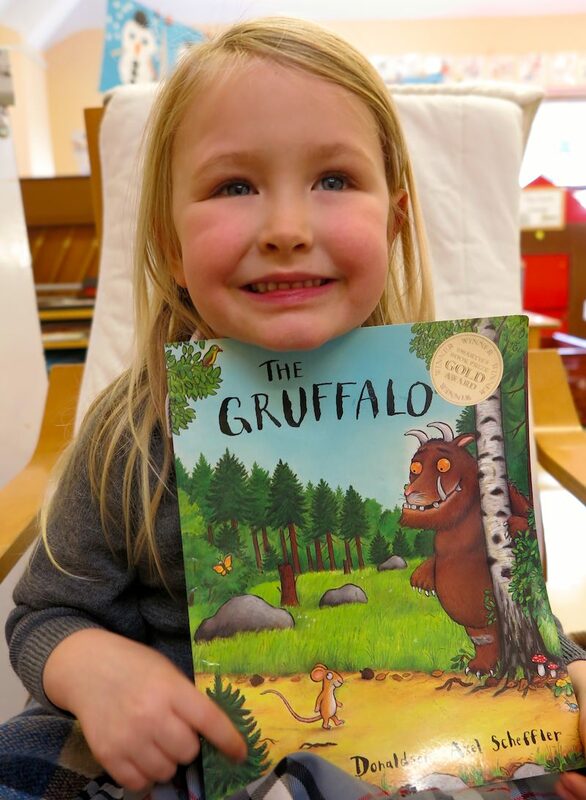 The Gruffalo by Julia Donaldson. I love this author's books and have yet to find children who disagree so that's why several feature on my list! This one's about a quick-witted mouse, a deep dark woods, several other scarey creatures and of course the Gruffalo himself! Children love the rhyming text, the descriptive language and the humour. The Gruffalo is a story that we can act out in our woods and use to find out about the native wildlife around us. 7. Room on the Broom by Julia Donaldson. This is the fantastical story of a witch and her cat who pick up various creatures on her broomstick. 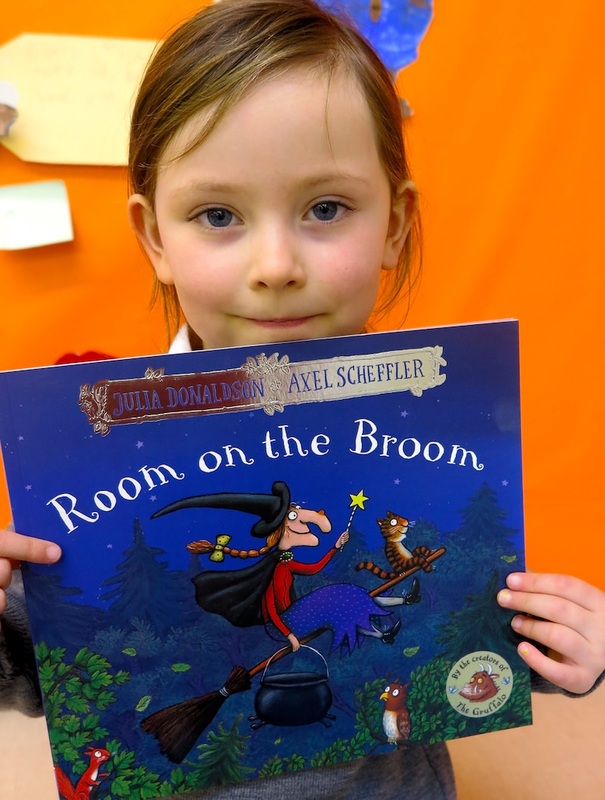 Like all Julia Donaldson stories, there's a clever theme that is ideal for discussing with young children .Children love the rhyming text, the descriptive language, the humour and the illustrations and then invariably want to make their own 'spells' in a cauldron! 8. Super Worm by Julia Donaldson. This is a really fun book about a kind worm that looks out for his friends and a nasty lizard. It has a positive message that if you help others, that kindness will be returned. The verses in Superworm are simple and short, making it great for younger readers and moments when attention spans are low. The pictures of everyday garden insects are good for learning about bugs. 9. Mr. Wolf’s Pancakes by Jan Fearnley. A story for pancake day. Lots of the characters in the story will already be familiar to the children. Non of them will help Mr. Wolf to make pancakes, everyone is unkind to him. It makes him feel sad. The ending is both surprising and hilarious! 1. The Tiger Who Came to Tea by Judith Kerr. This is always a firm favourite. The children love the idea of a tiger knocking at the door, eating all the food in the house, drinking the taps dry and then the family head to a cafe for a cosy supper. 2. Cuddly Dudley by Jez Alborough. In this one, a penguin tries to escape his huge family only to find life without them is rather lonely. 3. King Change-a-lot by Babette Cole. This is the tale of a baby prince whose very selfish parents allow the kingdom to go to rack and ruin. A genie turns the baby into an adult and the parents into babies with hilarious consequences. 4. Lazy Jack by Tony Ross. In this, a very lazy boy is set to work by his mother but he completely misinterprets his mother’s instructions with ridiculous but amusing consequences. 5. The King of Tiny Things by Jeanne Willis. This is an enchanting tale that teaches children to appreciate the beauty of nature. 6. The Paper Bag Princess by Robert N Munsch. A good one for girls and a story of girl power. Princess Elizabeth rescues her undeserving fiancé, Prince Ronald, from the jaws of a dragon only for him to criticise her appearance. She calls the wedding off and lives happily ever after! 7. The Lamb Who Came for Dinner by Steve Smallman. This is a heart warming tale of a friendship between a hungry wolf and a little lamb. The illustrations are so beautifully drawn and expressive that they practically tell the story by themselves. 8. Marvin Wanted More! by Joseph Theobald. A book that tells the tale of a sheep who wanted to grow stronger and ate up the entire world! 9. The Naughty Bus by Jan and Jerry Ork. This book's perfect for any child who who is mad about anything on wheels. In this, a very naughty toy double decker bus has a mind of its own and leads to trouble! 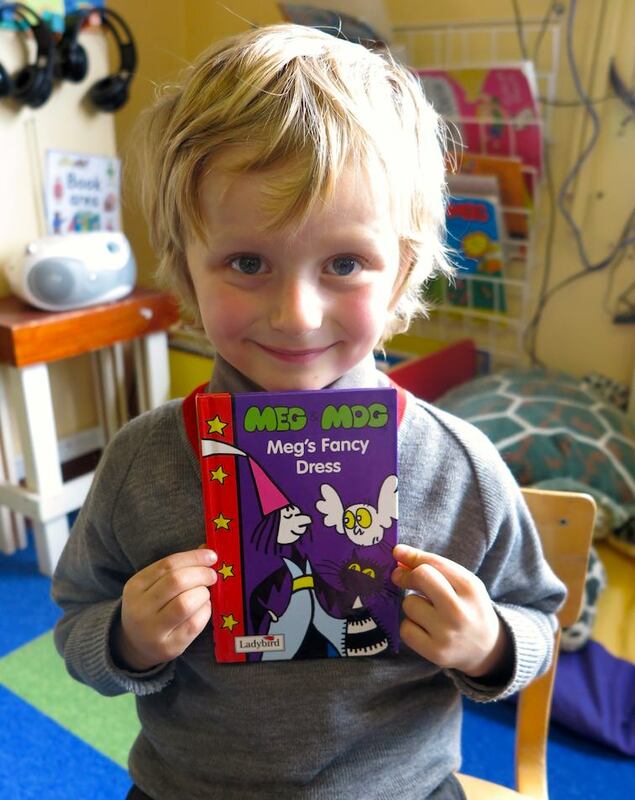 "Singling out 10 books that I'd recommend for Year 2 children is tricky – there are so many to choose from!" says Co-Head of the Pre-Prep Kirsty Miles. "So I've chosen books that I use in my literacy lessons and ask the children to produce work based on, books that I read to the children as a class text at that lovely time of the day when they sit and listen and get immersed in a story, books that I remember reading with my own children and also chapter books that children at this age are so desperate to start reading. There are so many more that I could have added to the list..."
1. The Man on the Moon by Simon Bartram. A clever story about a man named Bob who has the job of keeping the moon clean and tidy for the tourists that visit. Children love looking for the aliens in the pictures, the aliens that Bob never seems to see. 2. The Way Back Home by Oliver Jeffers. Space travel is guaranteed to capture the imaginations of young children. This story is simple about a boy who flies to the moon, runs out of petrol and is helped by a Martian who is in a similar situation. A fantastic moral about friendship and brilliant illustrations. 3. Willy the Wimp by Anthony Browne. This is another class book that I use, this one focuses on Willy who is being picked on at school. There is so much to look at and work out on every page. It deals with a sensitive issue but in a light-hearted way. A clever story. 4. A Bear Called Paddington by Michael Bond. Another classic story to read to the class. Funny, simple adventures that always get a laugh. The recent films have rekindled the love for these stories. 5. Katie Morag by Mairi Hedderwick. There are many books in this series and they all follow the life of a little girl named Katie Morag and the adventures she has on the small Scottish island she lives on. She is very mischievous and is often in trouble which children love to hear and read about. The books are a great resource for comparing other cultures and ways of life. 6. Dear Teacher by Amy Husband. This book is about a boy with a marvellous imagination who writes fictitious letters and postcards to his teacher to explain why his not at school. He has the most amazing adventures and his excuses are hilarious. 7. George’s Marvellous Medicine by Roald Dahl. My favourite book as a child and to read to the class. Children love the silly high jinks of George and the revenge he has on his grandma. My favourite part is when he collects all the ingredients, it's guaranteed to make the class giggle! 8. World’s Worst Children 1 & 2 by David Walliams. I could have chosen any one of David Williams’ books, some are a little more scary, but these two books are a series of short stories about children with dreadful habits and hilarious nicknames. 9. The Cat in the Hat by Dr Seuss. A classic from my own childhood that's just as popular with children today. The rhyming couplets are brilliant in the classroom as they encourage rhyme and enable other rhyming couplets to be created. 10. The Worst Witch by Jill Murphy and Diary of a Wimpy Kid by Jeff Kinney. Too hard to decide between these two because both of these books are a part of brilliant sets that are excellent beginner readers when children are wanting to start reading longer chapter books. They're funny and entertaining and boys and girls enjoy both of them.